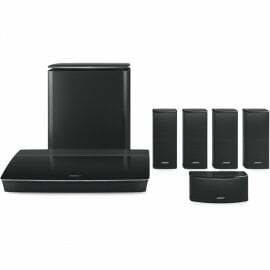 Bose Lifestyle 600 Home Cinema System, this home entertainment system is beautiful in every way, with acoustics for sound, aesthetics to look good and craftsmanship for its specification. Along with the simplicity to make it a easy to use system. With four speakers, including wireless surrounds for the rear and a wider centre channel speaker, this is a must have for the love music, that you love SoundTouch built in for the internet radio and music services such as Spotify and Amazon Music. Hear for yourself with the 5 speaker home cinema system. With Bose’s long history for creating Big Quality Sound from small products. These OmniJewel speakers, rewrite that history with a new chapter. These tiny speakers, feature carefully milled aluminium housing which has acoustic enclosures for drivers. The Key here is to use omnidirectional speaker for 360 degree sound making it a spacious home cinema experience. With wireless design, connect your speakers to your Bluetooth and have them accessible without the need for wires. With the resounding bass performance for music and movies. Bose wireless acoustics module delivers on sound and style, with a powerful drive and Quietport technology, combine with the best in class performance. This system lets you play music directly from a handheld device using Bluetooth, connect your system to the WiFi network for instant in house listening, without the need for your phone for the most premium of home cinema systems. With this simple system setup, it guides you with connectivity to all sources and features that the Lifestyle provides, with ADAPTiQ audio calibration it finely tunes the sound to match the size and specifications of the room so that you can get the most out of what you hear. The rear speakers and bass module connect wirelessly so that you can place it easily.